I began my weaving career after leaving university. Initially experimenting with various types of cloth construction I quickly became fascinated by drape, handle and colour mixing produced by the interlacing of warp and weft threads in woven fabrics. Experimentation with colour relationships and optical mixing has been on ongoing theme in the development of my work. I draw my inspiration from nature and light and colour in different parts of the world where I have travelled. 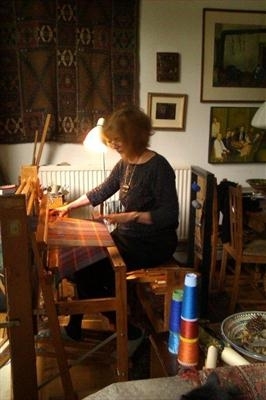 My work is entirely hand-woven, hand-finished and dyeing is an important part of my practice. 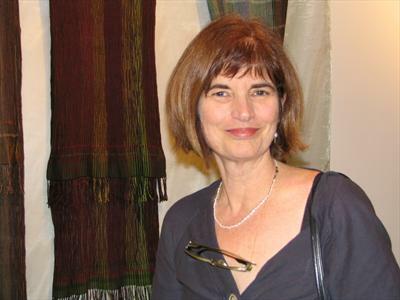 I work mainly in silk and fine wool weaving scarves and shawls. I sell my work through exhibitions, craft shows, shops and by commission. Teaching is also an important part of my practice. This includes teaching weaving classes in adult education, giving talks to guilds and running workshops on dyeing and designing with colour. I have also been an Artist-in-Residence in a number of primary schools. 2015 Form & Function Art Workers Guild, Art in Action, Artist at Home, Pond House Exhibition, Isfield, Sussex. 2007 AAH, Open Studio; Tracey Sheppard, Open Studio, Winchester.